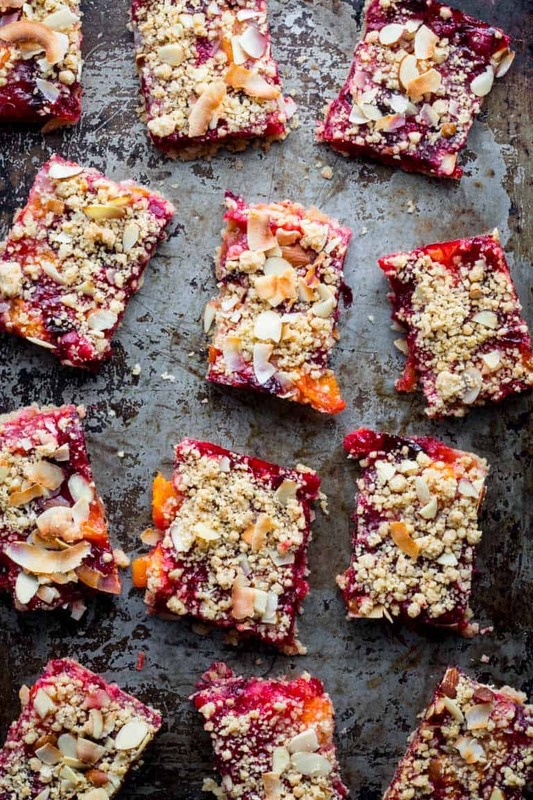 Cranberry Crumb Bars with Coconut and Clementine are an all time favorite baking recipe for a Christmas dessert or afternoon snack and any time around the winter holidays. 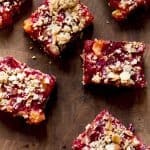 These Cranberry Crumb Bars were originally published here on November 20th 2012, and adapted from a recipe I developed for The Simple Art of EatingWell. The text and images are updated. These crumb bars never fail to make me so happy and so in the mood for holiday baking! I love the sweet tart balance of clementines and cranberries, the tender crumb topping and simple press-in crust. And the flavor of coconut to set it all off. 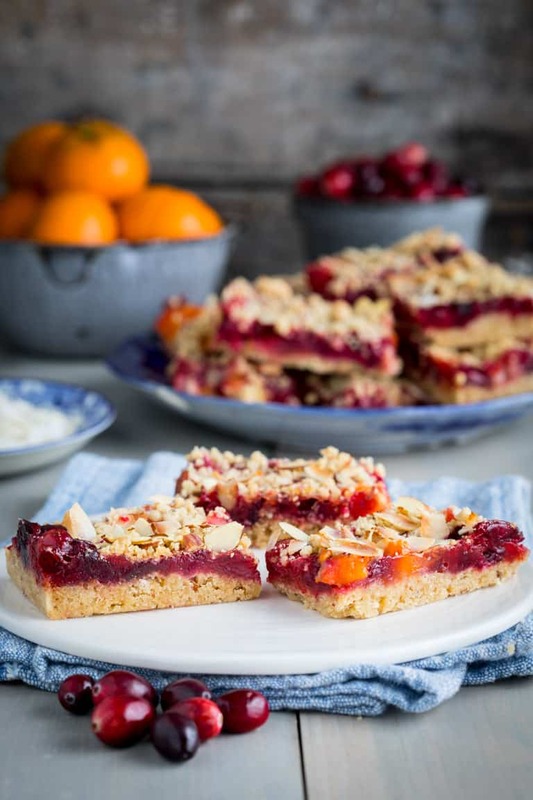 Back when I first shared these Cranberry Crumb Bars during the holiday season in 2012 I described the need for a bit of baking therapy and in the process inadvertently falling in love with this combination of ingredients. Today as I prepare to publish them for a second time, I am falling back in love all over again. There is something really special going on here, and I hope you will try them! Think of these bars being three layers. The fist layer is the bottom crust, the middle layer is the cranberry clementine fruit mixture and the golden crumb topping with coconut flakes is third. The bottom crust and the topping are actually made from the same base: You blend up some almonds, whole-wheat flour and sugar in a food processor to grind the nuts. Then add in coconut oil and a bit of egg to get it to clump together. Then you divide that in half- some for the bottom crust and some will be set aside to mix with almonds for the crumb topping. The cranberry clementine filling is made up of cooked cranberries, sugar and freshly squeezed clementine juice (you can sub in orange if you want.) Once that becomes nice and thick, you remove it from the heat and add in more raw cranberries and chunks of clementine. This makes sure that the texture has a bit of interest to it, and the clementines don’t break down too much. Press the crumb mixture into a baking pan. I really love the metal one I have from Bed Bath and Beyond. It has nice straight sides, so I use it to make sheet cakes too. After the crust is laid down, spread the cranberry mixture on top. After that, the remaining crumb mixture, blended with sliced almonds is crumbled over the whole pan. Then big fat coconut chips go on last. Once the Cranberry Crumb Bars are baked, the topping will be golden and the bottom crust will be set up and sturdy enough to cut into bars. Just make sure to let it cool before cutting them up. If you are looking for more holiday baking recipes, make sure you check out these favorites from years past! These Gluten-free Snickerdoodles look awesome too. Thank you for reading! If you’re new here you may want to sign up for my email list or follow me on facebook to keep up with the latest posts. If you make this recipe, please come back and give it a star rating and review. It really helps! 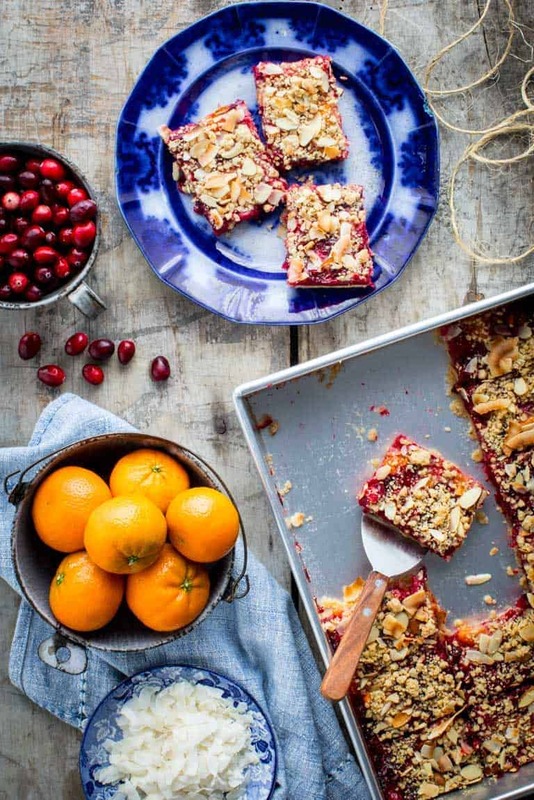 A Christmas and holiday baking favorite dessert or snack: Cranberry crumb bars adapted from The Simple Art of EatingWell. These have a simple crust that doubles as the crumb topping with almonds. There are fresh clementines mixed into the cranberries and coconut oil and coconut flakes added as well. Preheat oven to 400 degrees F. Generously coat a 9 by 13-inch baking dish with cooking spray. Reserve ½ cup of the crumb mixture and mix in a bowl with the remaining almonds. Press the remaining crumb mixture into the bottom of the prepared dish and set aside. Make the filling: Stir 3 cups cranberries, ¾ cup sugar, clementine juice and cornstarch in medium saucepan. Place over medium heat and bring to a simmer, stirring often. Continue cooking, stirring constantly until very thick, about 5 minutes total. Stir in the remaining 2 cups cranberries, chopped clementine, zest and 1 teaspoon vanilla extract. Spread the cranberry filling over the crust. Sprinkle the reserved topping over the top. Scatter the coconut chips over the topping and transfer to the oven. Bake 15 minutes. Reduce heat to 350 degrees and continue cooking until the filling bubbles and the topping is lightly browned, 25 to 30 minutes longer. Cool completely before cutting. Can I make these with frozen raspberries, blueberries, and/or strawberries instead of cranberries? I only have 1 1/2 cups fresh cranberries and tons of frozen berries. I do have fresh clementines as well. Please let me know how you would adjust this recipe for frozen berries. Thanks. Are coconut chips the same as coconut flakes? [quote name=Yomi]Can I make these with frozen raspberries, blueberries, and/or strawberries instead of cranberries? I only have 1 1/2 cups fresh cranberries and tons of frozen berries. I do have fresh clementines as well. Please let me know how you would adjust this recipe for frozen berries. Thanks. [/quote]My friend tried this, and they were too wet. If you want to try the berries I would use a little bit more cornstarch, like say an extra tablespoon. If your berries are thawed you can drain off some of the juice. Either way, make sure the filling bubbles when you bake it. Another note, you could probably drop the sugar in the filling a touch since berries are a little sweeter than cranberries. Good Luck and Please let me know how they come out! I just can’t take my eyes off from the screen! They look dazzling! 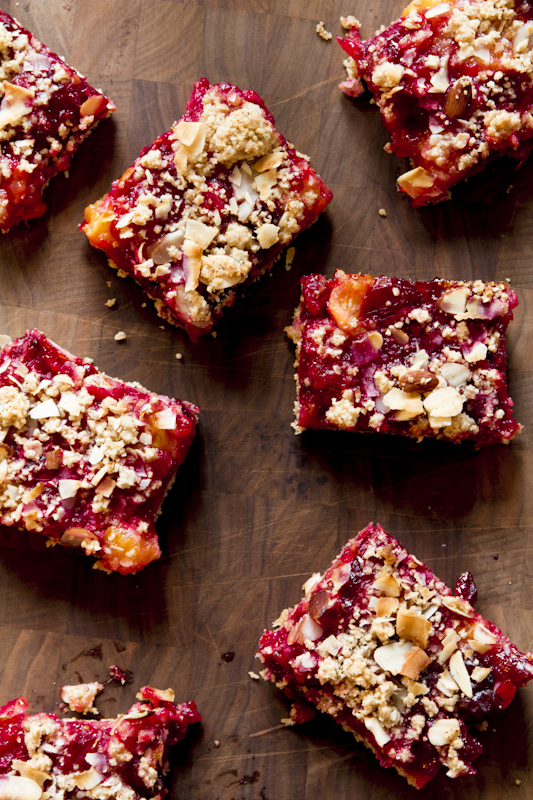 From the wholewheat crust/topping to the cranberry filling…just irresistible! [quote name=Averie Cooks]So vibrant and gorgeous! These sound like a delicious way to eat your fruit, I have a big bag of cranberries just waiting to be used. Thanks Suzanne. I agree:) Thanks for visiting. These are beautiful and I’m making them today. One question, I don’t have any coconut oil on hand. Is that mandatory or can I use a veggie oil or canola? Any oil would be good. I like organic Canola. How did I miss this? I’m so sad to hear about your Mamma and your puppy, but so glad your Mom is doing better now. Wishing her continued healthy healing. Sending you big…no…HUGE hugs! XO Hey…these bars are happening here this week! I love clementines- winter staple. Great idea to use some up, what a perfect pairing with cranberries. These are gorgeous. Love how you’ve incorporated so much flavor and color in this easy recipe! These are so festive and fun for the holiday season — and of course delicious! The photos are stunning! So sweet of you Valentina! Thanks! 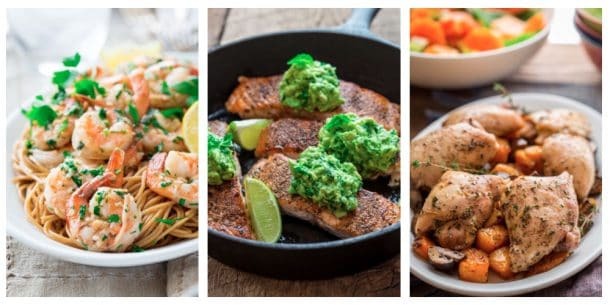 These look delicious and healthy. Would love to have some for snacking! They do make a yummy snack! So glad you think so too. Have a great holiday season Alina. 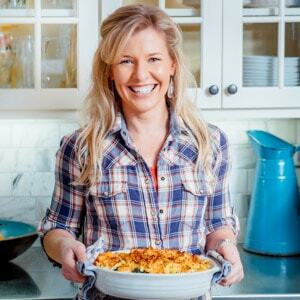 This recipe is perfect for the Christmas holiday season! Thanks so much Jacque. I hope you enjoy them. Have a great holiday season! Cheers! I need to try these ASAP. They look amazing! Thanks Megan! Have a great week. And please let me know if you do try them.